The power of the Shungite benefits lie in what makes it unique. Touted as the Miracle Stone of the 21st Century, Shungite has been around for an estimated 2 billion years, but it wasn’t until the 1996 Nobel Prize winning research that discovered antioxidant fullerenes within the stone, that people began to wake up to Shungite’s healing potential. It’s like the best friend in every romantic comedy who the love interest doesn’t realize is amazing until halfway through the film. How could we have overlooked Shungite for so long?! Now that it’s finally in the spotlight, we can’t get enough. The hallow fullerenes that make Shungite so remarkable are called “Buckyballs.” They’re molecular formations specific to Carbon, like that in the noncrystalline carbon mineraloid, that is Shungite. Just as Carbon has been used within water filters for centuries, so, too, does Shungite possess this purifying property. In fact, that’s how the Shungite benefits received its first bit of notoriety. It can only be found in Karelia, a remote location of Russia. During the time of Peter I the Great’s rule, he was looking to promote travel spots in Russia, and he decided to feature the long revered springs of Karelia. These springs run over sheets of Shungite, and even before Peter I the Great turned them into natural spas, locals would use pieces of Shungite to bring that spring freshness to the water in their home. All of these years later, science has helped to provide the evidence for what Russian’s have long known. Use the shungite metaphysical properties in an elixir in your water to add fresh-from-the-spring taste to home. We could all drink more water, and what could give you more encouragement than having cool crystal water to drink? The antioxidants in Shungite are powerful influencers on health and a fully functioning immune system. Trying enhancing your workout by replenishing with the Shungite benefits afterward. The anti-inflammatory aspect of these antioxidants is great for those aching muscles! Even more stunning than its cleansing properties in water are Shungite’s protective qualities. As a conductor of electricity, Shungite is known to aid in the inhibiting of EMFs, or electromagnetic fields, that are the result of electromagnetic radiation. Electromagnetic fields are created by electronic devices. Common electronic items such as laptops, cell phones, computers, and tablets all putout EMFs. Placing a Shungite sphere at the base of a computer, microwave or around your various home electronic devices will not interfere with their operations, but it will block out some of their free radial output. We’re all surrounded by electronics at work and home—maybe even more than we’d like—but with an added Shungite shield, that doesn’t have to be a bad thing; except for where distractions are concerned! Speaking of distractions, Shungite meditation can help with those too. Seriously, this is why it’s called the miracle stone. What can’t it do? Meditation with Shungite boosts performance by helping you to focus. Through reducing stress and relieving anxiety, Shungite properties can calm the mind of worry flurries, and give it the clarity needed for productive work. It also significantly enhances energy, which you can direct toward grounded concentration and a more positive outlook. 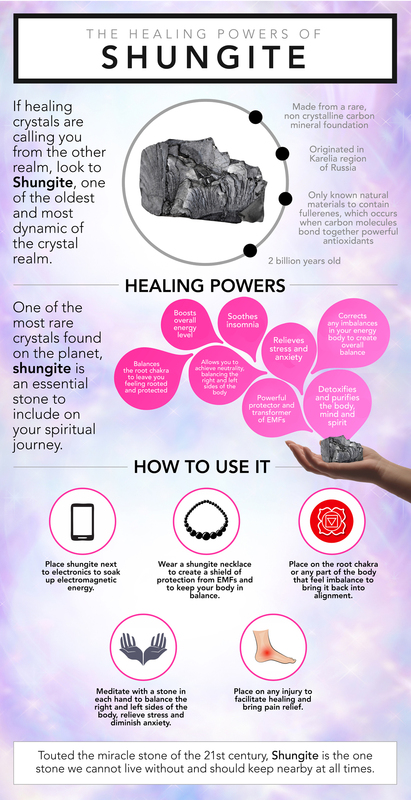 Shungite rejuvenates and balances the spirit. Whether you’re wearing it or meditating with it, Shungite works with your root chakra to support and raise your entire spiritual being from the ground up. This provides balance between the left and right sides of the body, and harmony between chakras. As a neutralizer, it will also block out the negative energy that comes from outside sources. People who act as energy vampires, draining you of your life zest, won’t have that effect when you are wearing Shungite. The energy is so strong, it counteracts their vibes with equally powerful positivity to neutralize their influence on your energy. Combine it with another crystal to amplify the desired effect. If you are looking to cut energy vampires out of your life, enhance creativity or bring abundance into your business, you can use crystal specific to those goals in tandem with Shungite for added efficacy and protection in the process. Shungite benefits are all about taking things to next level. Working with it allows you the opportunity to invest in yourself and ask what is it that you’d like to enhance. With this miracle stone in hand, the possibilities are limitless.